"Mende Nazer lost her childhood at age twelve, when she was sold into slavery. It all began one horrific night in 1993, when Arab raiders swept through her Nuba village, murdering the adults and rounding up thirty-one children, including Mende. Mende was sold to a wealthy Arab family who lived in Sudan's capital city, Khartoum. So began her dark years of enslavement. Her Arab owners called her 'Yebit,' or 'black slave.' She called them 'master.' She was subjected to appalling physical, sexual, and mental abuse. She slept in a shed and ate the family leftovers like a dog. She had no rights, no freedom, and no life of her own. Slave is a story almost beyond belief. It depicts the strength and dignity of the Nuba tribe. 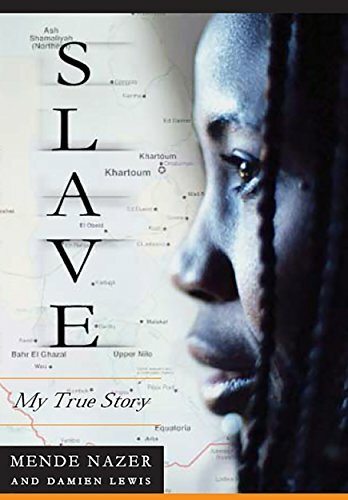 It recounts the savage way in which the Nuba and their ancient culture are being destroyed by a secret modern-day trade in slaves. Most of all, it is a remarkable testimony to one young woman's unbreakable spirit and tremendous courage."